This evidence-based therapy provides quick relief for muscle strains, improving flexibility. 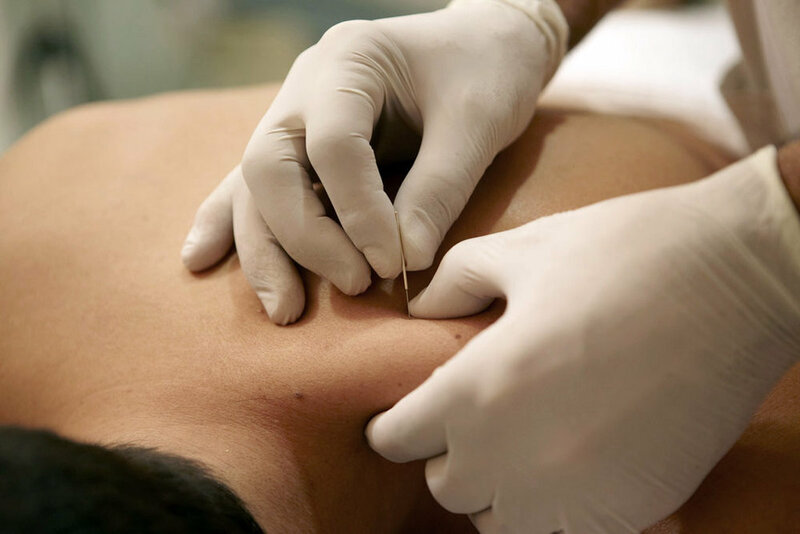 Dry needling is a specialized technique using thin needles to ease muscle and joint pain. When a muscle is contracted dry needling is used to “deactivate” trigger points, or painful knots, to provide decreased muscle pain and soreness, and increased flexibility. With trigger points, we insert the needle in the muscle knots in order to elicit a twitch response, which signals an intramuscular release. The twitch response is the muscle’s way of relaxing. When the muscle is relaxed, we can begin therapies to promote healing and prevent additional injury. Dry needling is an evidence-based approach to treating muscle, joint and nerve pain. When the needle is inserted, it creates a lesion in the tissue that can stimulate a twitch response to get the muscle to relax. Dry needling is also used to affect the nervous system for desensitization. Unlike massage, dry needling allows therapists to get deeper into the muscle where the source of the pain may lie. For example, a lumbar strain may involve the multifidus muscles, the deepest low back muscles and very difficult to palpate, especially with athletes. Dry needling allows you to go through superficial structures and ensure you get to the desired muscle(s) and achieve your therapeutic goal. Most physical therapy patients can benefit from dry needling in addition to other manual therapies but especially those suffering from pain due to muscle strain, as in the case of migraines or headaches due to muscle tension, TMJ pain, tendonitis, plantar fasciitis, or back pain stemming from muscle strain. Dry needling is great for people with acute (recent) or chronic (prolonged) injuries because it’s a swift method of treating a spasmed muscle so you can get better faster. However, dry needling is an option of many treatments offered at Steve Kravitz Physical Therapy and used only when patients do not have an aversion to needles.